This has been an active season for Common Bagworms (Thyridopteryx ephemeraeformis) in Ohio with heavy localized populations observed in many areas of the state. Thankfully, the damage caused by these caterpillars wrapped in silk bags festooned with host plant debris is drawing to a close. A high percentage of bagworms in southern Ohio have now tied their bags to anchorage points and closed their bags' openings in preparation for pupation. Bagworms are also initiating their annual "tie-off" in the central and northern parts of the states. Of course, you may still find a few bagworms within any population that are relatively small and continuing to feed which is presumably the result of extended egg hatch earlier this season. The upside of finding bagworms that are sliding towards pupation is that plant damage from these general defoliators will soon draw to a close. The downside is that effective management options are now limited to "picking and destroying." Bagworms are somewhat unique compared to most moths. Male adult bagworm moths superficially resemble dark colored flies; they have wings that lack scales and are very capable flyers. The males also have large antennae that they use to detect and track the "scent of the females." Male bags will soon be identifiable by pupal skins sticking out of the bottom of the bags. 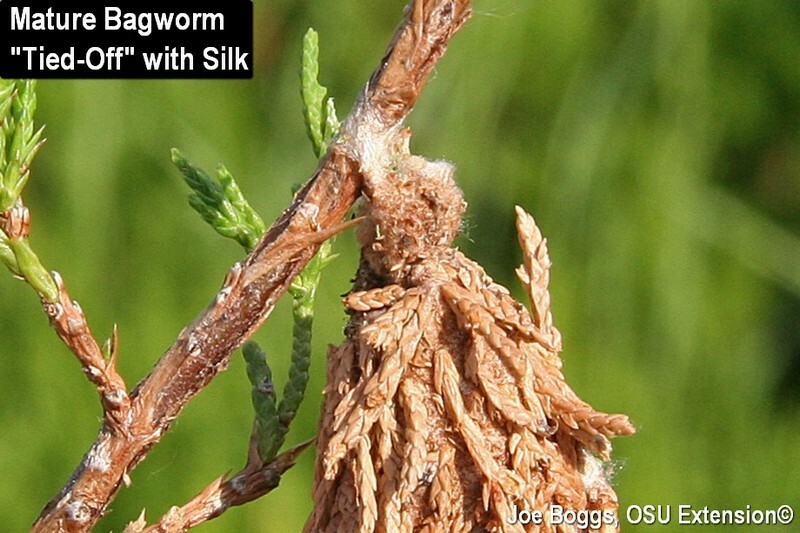 Bagworms camouflage themselves by weaving pieces of their host plant into their silk bags, so look closely! You also need to pay close attention to deciduous trees and shrubs. It is a common misconception that bagworms only eat evergreens. Indeed, an alternate common name used in many southern states is "evergreen bagworms." In fact, the caterpillars can feed on over 130 different species of plants including a wide range of deciduous trees and shrubs. One of the most damaging bagworm infestations I've ever photographed were feeding on a small crabapple. After running out of leaf-food, the caterpillars began stripping the bark on the tree's small branches and twigs to feed on the sugar-rich phloem. Deciduous trees and shrubs are sometimes overlooked during bagworm inspections allowing the plants to become reservoirs for infestations to spread to neighboring host plants. The only effective control option that is currently available is to pickoff and destroy the bags which will eliminate the females. This control method remains effective throughout the fall, winter, and spring to destroy the eggs before they hatch. Bags should be destroyed rather than simply being dropped to the ground; eggs will still hatch from bags on the ground. Late instar bagworms have the ability to detect insecticide toxicants which can cause them to hasten pupation; however, they do not die. Of course, their feeding cessation supports the perception that they have been killed. While the early-pupating females may not produce as many eggs as a normal females, they will still produce enough eggs to support a reappearance next season. The deception explains why damaging bagworm populations may recur the following season in landscapes where insecticide applications were made too late during the previous season.